This study is performed to confirm a clinical diagnosis of brain death. Brain-specific or lipophilic tracers which cross the blood-brain barrier (eg, Tc-99m HMPAO or Tc-99m ECD) are preferred over non-specific or lipophobic tracers (eg,Tc-99m DTPA), which are considered angiographic radionuclides. Go back to Neurology (Nuclear) imaging. In the flow phase, whether the tracer is brain-specific like Tc-99m HMPAO or Tc-99m ECD or is angiographic like Tc-99m DTPA, the tracer will be seen in the carotid arteries. This confirms an adequate bolus was given. In the delayed phase (15-20 min after tracer injection), the brain-specific tracer will be seen in the cerebrum, basal ganglia, thalami, and cerebellum. The angiographic tracer will be seen in the dural venous sinuses. This combination of findings is interpreted as negative for brain death (because there is evidence of intracerebral perfusion). The above image is an example of a negative brain death scan using an angiographic tracer like Tc-99m DTPA. In the flow phase, tracer is seen in the common carotids and anterior and middle cerebral arteries (double and single arrows, respectively). In the delayed phase, tracer accumulation is seen in the superior sagittal sinus (arrowhead). The below image is an example of a negative brain death scan using a brain-specific tracer like Tc-99m HMPAO. In the flow phase, tracer is seen in the common carotid arteries and anterior and middle cerebral arteries (double and single arrows, respectively). In the delayed phase, tracer accumulation is seen in the cerebral parenchyma. In the flow phase, no matter the tracer, the tracer should be seen in the carotid arteries. This confirms an adequate bolus was given. In the delayed phase (15-20 min after tracer injection), the brain-specific tracer will be absent in brain tissue. The angiographic tracer will not be seen in the dural venous sinuses. This combination of findings is interpreted as positive for brain death (because of absent intracerebral perfusion). The above image is an example of a scan positive for brain death using an angiographic tracer like Tc-99m DTPA. In the flow phase, tracer is seen in the common carotid arteries (arrows), confirming an adequate bolus. No intracranial tracer activity is seen in the delayed phase. 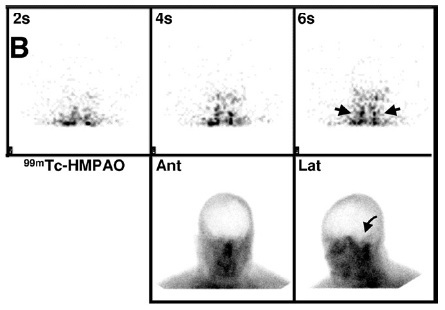 The below image is an example of a scan positive for brain death using a brain-specific tracer such as Tc-99m HMPAO. In the flow phase, tracer is seen in the common carotid arteries (arrows), confirming an adequate bolus. No intracranial tracer activity is seen, including in the posterior fossa (curved arrow) in the delayed phase. SPECT imaging helps differentiate scalp, parotid gland and neck muscle uptake from intracerebral uptake. It also helps assess the brain stem, allowing for assessment of the whole brain (cortex plus brain stem). This may be important because a clinical exam suggestive of brain death is based on brain stem findings. However, it is technically difficult to perform SPECT in patients suspected of having brain death due to inability to bring the gamma camera detector close to the patient's head (due to tubes and ventilator-related instrumentation), thus producing poor quality images. In most cases, flow and delayed planar images are sufficient for evaluation. In cases where scalp or other uptake of tracer is confounding interpretation, SPECT may be indicated. The principle of the "death brain" radionuclide scan is that absence of intracerebral perfusion confirms brain death when there is a working clinical diagnosis of brain death. The study alone should not be used to confirm brain death. The most common radionuclides are those used for radionuclide angiography, Tc-99m DTPA and Tc-99m pertechnetate, but in clinically difficult cases first-pass extraction tracers that represent perfusion of cerebral tissue, namely Tc-99m HMPAO or Tc-99m ECD, can be used. The basic protocol is a flow (or angiographic) phase followed by a delayed phase obtained 5-10 minutes after injection of tracer. There are no documented issues such as contraindicated medication that can interfere with the quality of the study. A study that demonstrates absence of intracerebral perfusion (thus positive for brain death) shows tracer flowing through the carotid arteries and into the base of the skull, where the flow of tracer stops. This is due to increased intracranial pressure. Adequate bolus administration must be ensured, and distinct activity in the carotid arteries is used as a confirmatory sign. Any study that shows tracer flowing through the carotid arteries and into the base of the skull, then into the intracerebral region (i.e., into the brain) is interpreted as negative for brain death. A small amount of sagittal sinus flow without obvious intracranial arterial flow is controversial, but may represent some intracerebral flow. Mettler, Jr., FA and Guiberteau, MJ. Essentials of Nuclear Medicine. 5th ed.